Chia seeds are an amazing base for pudding because they swell when combined with liquid. Combine chia seeds with almond milk, cashew milk, or coconut milk for a naturally creamy, healthy pudding you can flavor in so many different ways. In this particular chia pudding recipe, chia seeds are combined with unflavored almond milk, honey, vanilla paste, ground cinnamon, and plump Medjool dates. The cinnamon and dates really make this recipe, the rich flavor of cinnamon and soft, plump dates coming together in an irresistible combination. After chilling for a few hours, the chia seeds absorb the almond milk and transform into a deliciously thick pudding that is light and refreshing but also packed with protein and fiber. The dates soften even more when chilled in the pudding. 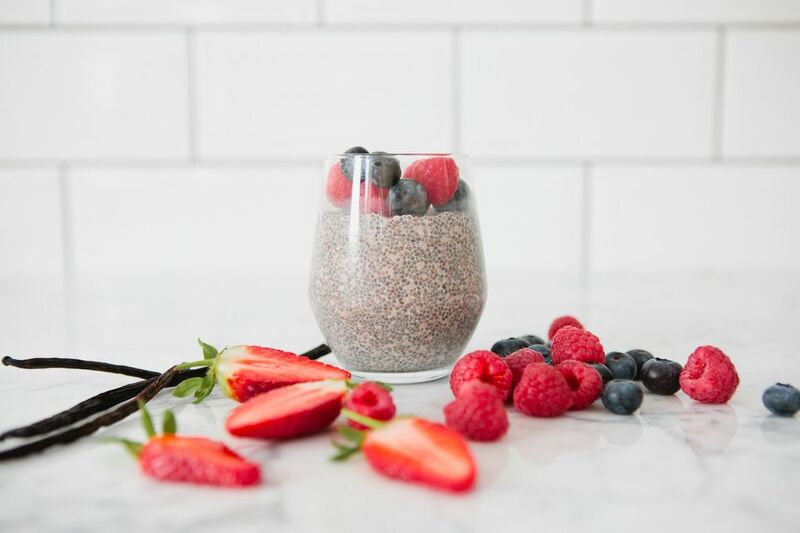 You can eat the chia pudding as is, or top with fresh berries, such as strawberries and blueberries for an even more refreshing breakfast. For added crunch, add almonds, walnuts, or pistachios over top the pudding. Place all ingredients except dates in a mixing bowl. Whisk together until well combined. Stir the quartered dates into the chia seed mixture until just combined. Cover and chill overnight, or at least 4 hours. Stir once or twice to de-clump any seeds that may have clumped together. Divide chia pudding into two bowls. Top with sliced strawberries, blueberries, and a handful of choice of nuts, if desired. Reminder: Always make sure your work surfaces, utensils, pans and tools are free of gluten. Always read product labels - not all brands are created equal. Manufacturers can change product formulations without notice. When in doubt, do not buy or use a product before contacting the manufacturer for verification that the product is free of gluten.